Saint Ralph is about an imperfect 14-year-old named Ralph, whose imperfections are outweighed by his powerful faith in the supernatural. Ralph deals with his life with surprising grace and optimism despite some troublesome circumstances, including a single mother and overbearing Catholic school. Then, as if he doesn't already have enough to deal with, his mother falls into a coma that the doctors say is irrecoverable. Ralph then gets it in his head that God will heal his mother if he enters and wins the Boston marathon. So he trains vigorously under the guidance one of his teachers, Father Hibbert. 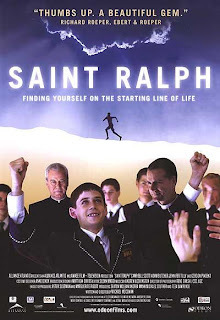 Father Hibbert encourages Ralph even though the school's principal, Father Fitzpatrick, condemns the boy's ideas as ridiculous, even sacrilegious. It is appropriate that Ralph should be viewed as a saint for the powerful effect of his actions, which God utilized despite his imperfections. The fact that Ralph makes a fitting saint runs contrary mainstream religious thought, however, as Catholicism makes sainthood too much about people's accomplishments and not enough about God's accomplishments through people. A genuine saint would prefer to be invisible so that Christ alone will be visible through them. Therefore, if we agree with the saints' saintly thinking, we shouldn't focus on any saintly person's saintliness... we should spend all our time and energy focusing on Christ's divinity. The amazing thing about people who are used by God is that God works through them despite their imperfections. In other words, the fact that certain people are used by God is in no way a credit to these people. We should measure a saint's saintliness by how much they demonstrate God's miraculous grace, not by how much they demonstrate their own discipline or ability. This is why the idea of sainthood, or canonization, is impractical (and silly) from the point of view of God's kingdom. Christ came in the flesh to demonstrate God's priorities to humankind, which are spiritual. In Christ we can acknowledge our present imperfections while we press on toward perfection. This way we can take action effectively to establish God's kingdom on earth, all the while enjoying a healthy, reconciled outlook on our lives. We should not focus on any shortsighted, religious definition of perfection, but rather let's give up our right to define perfection and let Christ define Himself through us. "I do not consider myself to have taken hold of perfection yet... but one thing I do: Forgetting what is behind and straining toward what is ahead, I press on toward the goal to win the prize for which God has called me heavenward in Christ Jesus." Patrick, I enjoyed reading from your blog this morning. You have quite the talent with writing and it's refreshing to see it used so uniquely. “Mercy, peace and love be yours in abundance.” Jude second verse I’ll be back to read again.